A solid second round helped the Canadian show jumping team finish second behind Germany at the BMO Nations' Cup at Spruce Meadows on Saturday. Canada sat in fourth spot behind Germany, the United States and Ireland after the first round, but jumped up all the way up into the silver-medal position thanks to clean rides by Eric Lamaze and Kara Chad and a solid performance by Lisa Carlsen, who received just a single time fault. Ian Miller also competed for Canada at the event. "It's always better to win, but if you're on the podium at Spruce Meadows, it's a heck of a result," said Canadian chef d'equipe Mark Laskin. "We kind of started slow and knew that if we could get to the second round that we could make a push. "Our riders, they're good riders and they're very capable of correcting mistakes and that's exactly what they did. It's sort of like making halftime adjustments. When you're getting run over offensively in football, you make some adjustments and it's an entirely different game." Meanwhile, Germany cruised to its first victory at the international show jumping event since winning back-to-back titles in 2012 and 2013. "They never wilted at all," Laskin said. "We kind of knew as we got into the second round that we were probably just jumping for second." After Philipp Weishaupt opened up with 17 faults as Germany's first competitor, Holger Wulschner, Andre Thieme and Marcus Ehning all had clean rides. That meant that Germany could eliminate Weishaupt's ride and advance to the second round with a perfect score of zero. "Holger had to clear and then I had to clear and then we all knew that Marcus was going to have for sure a good result and he went clear," said Thieme, who was assessed a time fault in the second round, while Holger had another clear ride and Weishaupt improved to just five faults. "Out of the blue, we were leading by far. "We just had to save it in the second round. We saw that Canada's coming up strong. We also saw that the Irish kept it together pretty much, so we already were thinking 'ai-yai-yai' and then Philipp was much better the second round." Since Canada had the next best total of 13 faults through two rounds, the Germans had already clinched top spot, meaning that Ehning didn't even have to ride in the second round. "I was lucky that I didn't have to ride," Ehning said. "It's always nice to win even without riding." After the preliminary round, the U.S. sat in second spot with eight faults, followed closely by Ireland (10 faults) and Canada (12 faults). 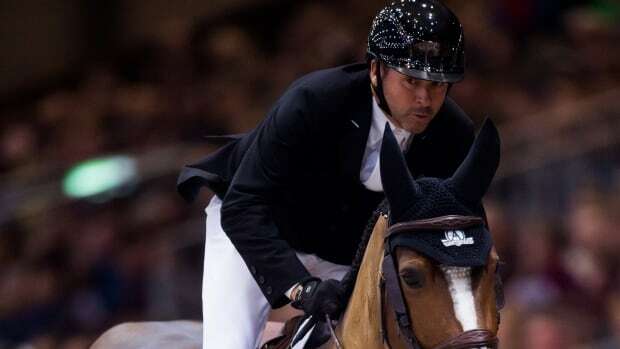 Mexico and France were tied for fifth place with 17 faults apiece, while Belgium, Switzerland and Brazil failed to make the cut for the second round with scores of 20, 26 and 40, respectively. Brazil won the Nations' Cup title in 2015 and finished second behind the U.S. last year.